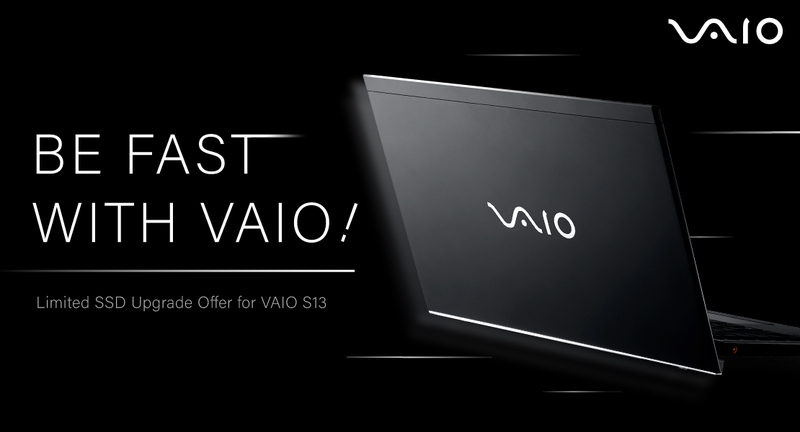 Home Latest Offer Be FAST with VAIO! Limited SSD Upgrade Offer for VAIO S13 delivers the ultimate responsive user experience! Be FAST with VAIO! Limited SSD Upgrade Offer for VAIO S13 delivers the ultimate responsive user experience! Due to overwhelming response, we’re extending the limited SSD upgrade offer! Purchase VAIO S13* to get free upgrade from 256GB SSD to 512GB PCIe SSD! (worth SGD$329) Together with the unique VAIO TruePerformance technology, you can enjoy ultimate high speed user experience. Customers carry-in VAIO S13 with original copy of the invoice from local authorized dealers to any of the VAIO authorized service center. The original 256GB SSD will be collected by the service center after the upgrade and will NOT return to the customers. All the personal data in the original SSD CANNOT be retrieved after the upgrade, customers have to backup by their own before the upgrade. Downgrade to the original setting will NOT be accepted upon the completion of the upgrade. Nexstgo will NOT responsible for any cases of data loss or resolve during the upgrade. Free upgrade 512GB PCIe SSD is only available while stock lasts. Eligibility for 512GB PCIe SSD is limited to purchase of genuine products from Singapore authorized dealers only. The offer is applicable to end-user and for personal use only. Non-end-user redemption will not entitle any offer. In the event that 512GB PCIe SSD is out of stock, Nexstgo reserves the rights to offer an alternative gift of equivalent value. Nexstgo reserves the right to cancel or change the offer. Terms and conditions apply and is subject to change without prior notice.